As the marijuana industry blooms, women are finding their footing in the workforce. In a field yet to be dominated by men, women in the weed business show that their skill, experience and raw ambition stack up against anything men can do. These five women, from different areas of the medical marijuana business, exude the qualities and badass-ness that is teeming in the female founders of the industry. Adriana Tysenn's grandmother used to tell her, "La mota es el Diablo." Now, as general manager of Downtown Dispensary, she looks back on the sage advice and laughs. It wasn't until marijuana helped her overcome years of pain as the result of a debilitating injury that Tysenn came to realize marijuana's medicinal benefits firsthand. "I come in here every day remembering where I came from as a scared, young girl, not knowing that this was a medication and not knowing this could help me regain my life back truly," she said. When Tysenn was 16 years old, she suffered a spinal cord injury at a cheerleading camp at Norther Arizona University. After catching a fellow cheerleader, her arms and legs felt numb and she had difficulty walking. Doctors initially misdiagnosed Tysenn for a rotator cuff injury. She attended physical therapy sessions for a year. At one point, doctors flagged her medical chart for potential opioid abuse due to the amount of medication she needed for the pain. Eventually symptoms indicated injury beyond her shoulder. An MRI revealed she had a spinal cord infarction. The opioid and narcotic prescriptions continued for another six years until a college boyfriend suggested marijuana after witnessing its ability to treat multiple sclerosis. "I never even thought of it as a medicine," Tysenn said. The first time she smoked marijuana, Tysenn didn't need any other pain medication for eight hours. Tysenn's doctor noticed a decrease in the use of her prescription and a urine analysis confirmed her marijuana use. "I thought I could be open about it, because this man who was my doctor sat in front of me in church every Sunday, and I thought this was somebody who genuinely was there to help me," she recalled. However, he wouldn't help her transition off the opioids and begin marijuana treatment fulltime. So, she found a doctor who would. It took her six months. "It was one of the most difficult things I've ever had to go through," she said. Now she gets to help others make the same transition. "I think that's probably the most amazing part of this job," she said, "getting to help people in the same situation that I was in, and being able to share and empathize with them about that experience." Dr. Hope Jones is a scientist at heart. Her love for cannabis comes not from its effects on the human brain, but is instead rooted in her love for the plant itself. Jones was recently hired on at C4 Laboratories as their chief scientific officer. "It's a perfect blend of all my backgrounds," she said. Jones' experience ranges from closing dive bars as a bartender to stints at NASA, where she developed systems for growing crops during deep space missions. She draws on all her experience to do a job that she loves: using hard science to serve the people. At C4 Laboratories, Jones analyzes cannabis for THC levels, mold and other traits. "It's exciting to be able to still works with the plants, to still have the data-driven need that defines my scientific brain," she said. After earning a bachelor's in plant science and a Ph.D. in Molecular and Cellular Biology, Jones first entered the cannabis industry in November 2016 when she created Emergent Cannabis Sciences with her husband, Chris. Working with her husband, Jones has been able to hone her confidence in being professional and direct. Other challenges, Jones handles a different way. "I'm gonna just walk through the plants," she said. "I'm just going to look through the canopy and I'm just going to breathe a little bit of mindfulness that allows me to regroup." Even in managerial positions Jones gets down and dirty with the plants. While managing a growing facility, taking a hands-on approach helped her connect with other workers on a deeper level than other managers might have reached. Her emotion reminds Jones of her role as a woman in industry, but it's also what helps her succeed. "Science is—I always found—a little bit different than that," she laughed. "But maybe that's why I like bringing a little bit of the science and industry into the business." Jones learned how to utilize her compassion at the Pima Community College Nursing Program. She said seeing how the women there used their emotion to relate to and help patients empowered her to emulate that quality. 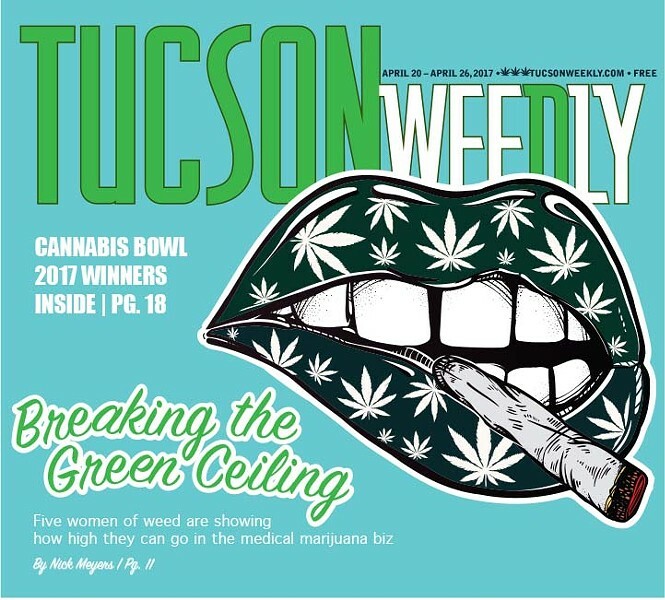 She admires other women scientists like Chieri Kubota, under whom she studied at UA, and Sue Sisley, a medical marijuana researcher in Phoenix. "Yeah, she's my female cannabis badass," she said. When Arizona passed legal medical marijuana, Vicky Puchi-Saavedra went all in. Her experience as a real estate agent helped her pick out five properties around town that were likely to be chosen as potential locations for future dispensaries. When then-Gov. Jan Brewer sued the state three days before applications began, Puchi-Saavedra paid rent on those properties for two years, taking out high interest loans to afford it. "By the grace of God, I was awarded one—this one," she said sitting in her office at Earth's Healing dispensary. She says she put her life-savings on the line. Locations for dispensaries were chosen like lottery numbers, numbered balls were chosen out of a tumbler. The experience was nerve-wracking. "Call it luck," she said. "Call it a blessing. Whatever it was, it wasn't me." While her vibrant stubbornness earned her a place in the ring of dispensary owners, what Puchi-Saavedra will take credit for is picking good employees. She spent the first few years of business paying off loans. Now, in part due to the help of her marketing director, Florence Hijazi, Earth's Healing is a profitable business. Puchi-Saavedra says they're picky when choosing products, and their customers are grateful for it. Despite the dispensary's location on the outskirts of town, near the airport, Earth's Healing draws customers from all over Tucson. "It's a happy place to come and work," Puchi-Saavedra said. When she opened her dispensary, she had three employees, two of whom were her kids. They still work there today; at home they're a family, at work they're teammates. "I try as hard as I can not to be a mom at work," she said. "But that never goes away." Puchi-Saavedra sees stigma in the rest of the workplace as the biggest challenge women face in the industry, but says tenacity, perseverance and patience make women successful in the marijuana industry. "Had I not had the patience and the tenacity and the willingness to give up everything to acquire my dream—and I did," she said. A brown Indian motorcycle parked outside Dr. Heather Moroso's clinic is a reminder of her days as a bartender at Tommy's and the Buffet. In her office, her uniform is a blue flannel button-down over a matching undershirt, blue jeans and a pair of leather riding boots. Moroso started working with HIV/AIDS at El Rio Health and the Southern Arizona AIDS Foundation. When marijuana became legal, her phone started ringing with patients requesting prescriptions. "Next thing I know, I was supposed to be an expert, and I wasn't," she said. "So I learned everything I could." "It was a little weird at first," she said. "But the more you just talk about it, the more stigma you erase." After the recession, Moroso lost her job and started bartending. The stint taught her a lot about people and helped make her the woman who now runs her own clinic. Moroso focuses on educating and destigmatizing marijuana use. She gives her patients—ranging from ages 2 to 94—the knowledge they need to determine if marijuana is right for them, and the best means of use. She's helped a girl decrease her seizures from 80 a day to two. She's helped a man cut 300 pills out of his monthly pain medication dose. "I've seen people who are told to go home and die make a Hail Mary pass for concentrated cannabis oil and their cancer is gone," she said. Moroso's influence for starting her own business comes from the women in the community around her. She's influenced by women who pioneered HIV/AIDS work in the early '90's and Terri Poch, a former WWE wrestler for whom Moroso worked at a local gym during high school. Through her clinic, Moroso demonstrates the sort of independence that the marijuana industry allows to flourish. "As a woman, sometimes we feel like we can have our own voice as long as it's not too loud or too different," Moroso said. "I've never believed in that—granted I've been fired a few times in my life because of it." Moroso could claim to have broken the mold, but only because she never fit into it. Her practice allows her to be herself, something she hopes all women can achieve. "It's okay to go against the grain," she said. "Sometimes the greatest ideas in the world come that way." A life-long Republican, Dr. Sue Sisley never saw herself leading the charge to open up marijuana research laws, but anecdotal accounts of the life-changing effects of marijuana for veterans with PTSD drove her scientific curiosity. "I'm always skeptical because I'm a scientist," she said. "I'm trying to ask questions and doubt people, no matter what they say." She believed her patients, but she knew she couldn't support marijuana for treatment until it overcame the rigors of the FDA process. "The biggest challenge I've had is wanting to do my research, but being forced to become an activist," Sisley said. Sisley started volunteering with the campaign to legalize medical marijuana in Arizona as one of the only physicians who would speak in favor of the need to make it legal so that it could be studied. "I'm not pro cannabis," she said. "I'm pro research." Since then, she has spoken on the same stage as Hillary Clinton and Donald Trump and has been featured in news outlets across the country. After trying to get her research off the ground at the University of Arizona, Sisley faced immense opposition from the administration resulting in her firing. She spent the next two years forging the partnerships that make her study possible today. "I've been forced to adopt an aggressive posture in trying to get our work underway, trying to deal with all these different attacks on scientific freedom," she said. Even with her trials well underway, Sisley still faces challenges. Earlier this year, Sisley complained that the federal government was providing low-quality marijuana for her research. The move caused John Hopkins University, which was supposed to conduct half the trial, to drop out of the study. Now she forges on with Scottsdale Research Institute, the sole facility continuing the research. "The key is the tenacity," she said. "There are so many things along the way that will derail you." Sisley sees her prerogative as twofold: to do good science and to change policy to allow good science. Sisley is a role model not just for young scientists, but some of the women on this list as well. She's admired for the risks she's taken and the sacrifices she's made to study the effects of marijuana on PTSD in veterans. Sisley herself looks up to her mother, Dr. Hanna Sisley.